Excellent Pizzas, and great chicken soup. Ask for some croutons, they are awesome. Excellent pizza, crispy crust, tasty fresh toppings. I would highly recommend the Veggie pizza! Last night, following a friend's recommendation, we placed our first order with the Gournet Pizza & Food company. Not only did our dinner arrive quickly but the pizzas were amazing! My daughter also loved her burger. Not only was the food delicious but the pizzas were very generously topped & sized. We will definitely be back for more!! Pete’s pizzas are simply the best pizzas I’ve every had. All my friends agree. I always order when friends visit so I can try more options and have lots of leftovers!!! The order process went incredible smoothly. The food was right on time. The quality of the garlic bread, salad and pizza was seriously amazing. Can’t see us having pizza from anywhere else in the future. 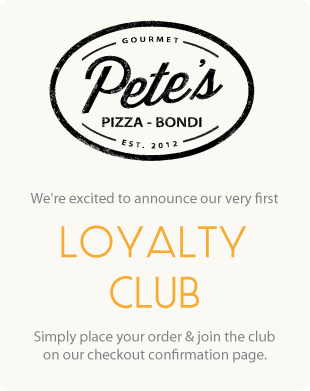 Best pizza's in Bondi Beach.